Chris Sale after issuing 3 consecutive walks, including the go ahead run for the Blue Jays in the top of the ninth inning in the last game of the season. 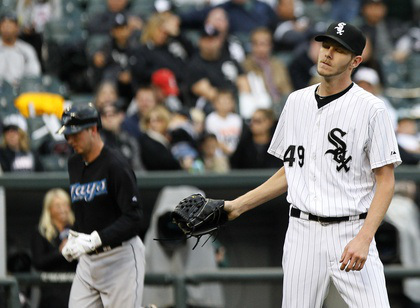 Despite the three walks Chris Sale does look like he will be good in the future! Yes, he’s one of my favourite new players on the team. I’m looking forward to seeing if they will convert him to the rotation next year, although we need to get the rest of the rotation sorted first – my first wish is that we re-sign Mark Buehrle.